This post is reproduced from a post of my Japanese blog. A friend of mine, an academic researcher in machine learning field tweeted as below. 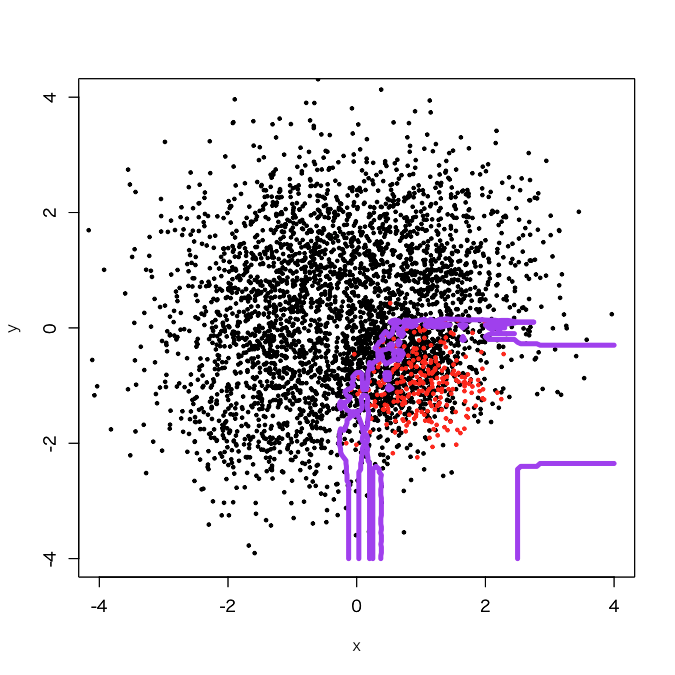 I've studied how to handle imbalanced data, but I found Wallace et al. ICDM'11 concluded that you should do "undersampling + bagging". In the other post of my Japanese blog, I argued about how to handle imbalanced data with "class weight" in which cost of negative samples is reduced by a ratio of negative to positive samples in loss function. If you use Python, already there is a good package for "undersampling + bagging". I prepared a dataset with 250 positive and 3750 negative samples. Please get it from my GitHub repository below. First, import it as a data frame "d". In addition, let's create a grid to draw decision boundaries. If you use randomForest, what you have to do is just to give a ratio of positive to negative samples to "classwt" argument. The result was as I expected; a little more expanded decision boundary than its original one. 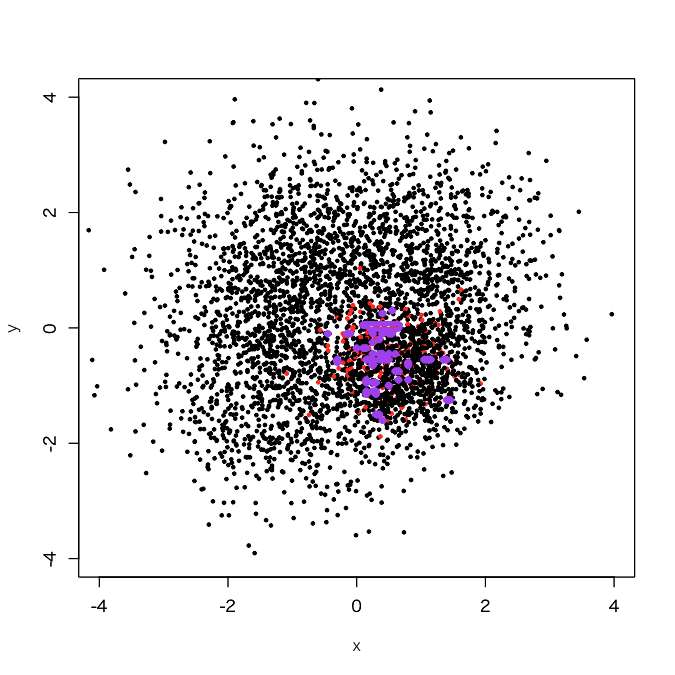 It looks that the classification region of the positive samples got expanded a little bit. How about 50 sub-classifiers? It appears that jaggy parts got reduced. OK, let's try 100 sub-classifiers. Got it, once it finished. The dataset above was generated by a script below. In short, positive samples in this dataset are concentrated in the lowest and rightmost part of the 4th quadrant, so I think it's natural that we got a result above. Thus, I tried to move the positive samples more inside, as embedded into the negative samples. OMG... what a tiny decision boundary, even like overfitting. OK, let's try "undersampling + bagging". For simplicity, I tried 100 sub-classifiers here. Yes, I didi it. You see a broad decision boundary in the 4th quadrant just near to (0,0), which looks to get a little bit more generalized than usual.